So it’s coming! Long we waited for it and soon it will be there: Voice chat in Second Life! There have been some experiments with it before, like first Vivox and then SecondTalk (which uses Skype) which both used some sort of in-world devide which connects a third-party application to the people around you. Thus you initiated the call in SL but actually just did a normal VOIP or Skype call outside SL. Now it’s going to be directly in the client using Vivox technology and using 3D sound (using technology from DiamondWare), meaning that you will hear the avatars speaking from their individual direction (read up on that at the Reuters post). Not included will be lip sync capabilities though as Linden Lab will only add that if it can be done in a believable way (according to Joe Miller of Linden Lab). Also not added will be ways to distort or change your voice to model it more like your avatar but both these things are planned for the future. Now what does that mean? Will it be used widely or will only a fraction of the population use it? That’s hard to say of course. For businesses it will definitely be great. You can make virtual meetings in an easier way without all that typing. For individuals it depends. Many people are anxious to have their voice heard and it might make approaching other people harder. And following a discussion in a german forum right now it will also make the language barriers more visible eventually. Many people who are not native english speakers might not want to talk in english although writing might be ok for them. Another point is that multitasking with voice is not really possible. You can have several IM conversations open at the same time but that’s hardly possible with voice conversations. And then there is also the immersion question. If lip synching is not added yet and you cannot really recognize if somebody is talking right now or not (other than the voice might come from that direction) then it might be hard to get voice and in-world situation together. I remember a discussion me and a group of people (around 10) did via Teamspeak and in Second Life. It was hard to keep the in-world feeling as the voice discussion going on felt very detached from the scene on my monitor. After a while we decided that the one talking should stand up so that we have a visual representation of that. The problem is also not unkown to me as the same problem was there when I started video blogging in Second Life or even just attending audio based events. Having zombie-like avatars (eventually even falling to “sleep” (away)) while hearing voice was not really a great experience. That’s also why I created my Vlogger Starter Kit which mainly consisted of a microphone and the talking head animation (so the lips are not moving but at least the head is). This at least gives a little clue to the eye that somebody is talking. 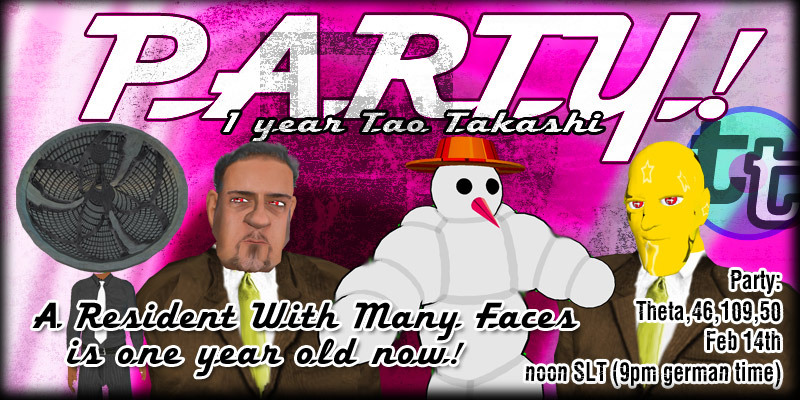 One Year Tao Takashi => Party! So tomorrow it has been one year Second Life for me. It was a great year indeed and Second Life (probably just because of my residentship) did a great leap forward, has all the press now and soon 4 millions residents. Thinking back it has been only near 140.000 residents been registered (althought counted a little differently). And I started blogging. My first post dates back to March 3, 2006 and was about a Camarilla event. I never thought that I would blog much as it never worked out for me since then in RL. But with Second Life it was somehow different and there’s quite a bunch of posts out there right now. Later I also created the well-known blog aggregator worldofsl.com and it’s sister the fashionplanet.worldofsl.com which are still constantly growing. On April 10, 2006 I decided to experiment with video blogging in Second Life. And here is my first episode I made back then. Apparently I already purchased some first land and I remember having nice friends amonst my neighbours. Unfortunately those are not anymore in Second Life and I am more or less surrounded by a big mall these days. But anyway, you can find the complete collection of Tao Takashi on Air here. Later I then met more and more Second Life developers (such as Timeless Prototype, Hiro Pendragion, FlipperPA Peregrine and many more) and podcasters/video blogger, such as Eric Rice (aka Spin Martin), Michael Verdi and Steve Garfield. I also contributed to many events, such as the 3rd Second Life birthday where I help with scheduling events and organized a machinima showcase (and here), the virtual Vloggercon and more. It was great working together with all those nice people such as Almathea Blanc, Mera Pixel, Tateru Nino, moo Money and many more. Other cool people I met were of course the metaverse consulting specialists such as Fizik Baskerville, the Millions Of Us people as well as those from the Sheep. Plone, the Open Source Content Management System I am doing consulting for with my company (as well as attending programming sprints, meetings and conferences) was brought into Second Life by me in October 2006, when the Plone Conference was being held in Seattle and we were streaming the event live into Second Life. Right now the plot is still there and we are planning to have some sort of BarCamp there someday soon. In the meanwhile you can watch episodes from my RL video blog COM.lounge TV there. This was especially a nice event as more and more Plone developers are joining now Second Life (and it even lead to some Second Life related job we are doing together with Lovely Systems now). It was after the Plone Conference 2006 that I went from Seattle to San Francisco to meet some Plone and Second Life people. I had a little visit at the Linden Lab offices which was quite nice (although most people were busy as there was a community roundtable going on at the same time). Ben Linden showed me around, I met Joe, Vektor, Jean, Jesse and others. Earlier in San Francisco I also met Dancoyote Antonelli, a great Second Life artist, who showed me around at the San Francisco Art Institute. Finally I also met Glenn Linden to talk with him about businesses in Second Life. All in all a great visit. First of all I was at the Snow Sprint 2007 in Sibratsgfäll in Austria. It was the 4th in a row and it’s all about 50 people meeting, programming on Plone related projects and having fun together in the snow. It was a great week and thanks again to the organizers around Lovely Systems! Actually at first I didn’t want to go, but Jodok of Lovely Systems convinced me to do so as we are working on a Second Life project together and it’s helpful to have all the people in one room together. So glad I did it 🙂 And the results were good, too. We made progress on quite a lot projects, for a more detailed summary look in my dev blog or later for videos on my RL video blog. Second Life also has still constant media coverage. So in the german edition of the Financial Times: A report about PA Consulting (with an appearance of RacerX Gullwing) and a report about legal issues in online worlds such as WoW or Second Life (actually the FTD has quite a lot of coverage, as you can see here). The same is true for Spiegel, a big german magazine and probably many other publications. There is also a vote at voteo.de where you can vote what relationship you have to Second Life. worldofsl.com and it’s sister planet fashionplanet.worldofsl.com, blog aggregators for the Second Life and SL fashion scene, are constantly growing. The Fashion-Planet has now about 70 blogs and the main planet has about 110 blogs listed. If you think your blog is missing, just drop me an email and tell me the URL of the blog, the name and if possible (and you know it) the RSS feed address.